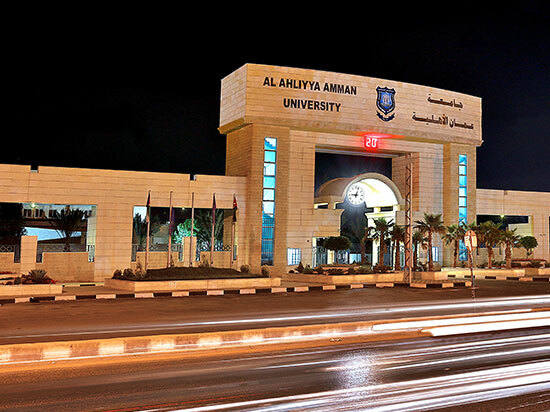 Al-Ahliyya Amman University is the first private university established in the Hashemite Kingdom of Jordan by a decree of the Ministry of Higher Education and Scientific Research in 1989. The University opened its doors in 1990 with three faculties namely the Faculty of Law, the Faculty of Arts & Sciences and the Faculty of Administrative & Financial Sciences. In the following year, the Faculty of Pharmacy & Medical Sciences and the Faculty of Engineering were established. In 2001 AAU founded the Faculty of Information Technology and inaugurated the Faculty of Nursing in 2005. In 2010, AAU introduced the Faculty of Architecture and Design which was approved to include Architecture, Graphic and Interior Design specializations. By doing so, the number of faculties became eight offering 29 Bachelor programs. Moreover, the University offered eight Master’s programs the first of which was the Master Program in Law which in 2005 was part of the Graduate Studies. AAU provides students with distinguished Graduate Studies Programs and with distinctive Faculty members. To meet the administrative, financial and technical working needs in the University environment, AAU has provided qualified administrative cadres in various administrations and departments which aim to provide the best services to the university community of students and their parents as well as to the academic staff. Thus, twenty seven years have passed since the inception of AAU in which it continued providing the local and regional markets with elite graduates who occupied important positions in local and regional institutions whether in the public or private sectors. Moreover, a number of AAU graduates have pursued their Graduate Studies in the most prestigious European and American universities. Additionally, a number of them is working in AAU and other Jordanian, regional and international universities. It is worth mentioning that the number of graduates in the various specializations that AAU offered reached (24.338) male and female students.